Magnificent, dramatic, exciting, mystical, inspiring, magical, sensual ... these are some of the words people use to describe the Madrona Tree, a favorite of the hardwood trees of the Pacific Northwest. Few trees excite the viewer as much as these do. When visitors come from around the world and discover them in their wild habitat, the reaction is instant: they fall in love with them! The Madrone Tree or Madrona Tree gets its name from the Spanish word madroño (which means strawberry tree...the early Spanish explorers named it after the similarities to a Mediterranean variety). In Canada, it is known as the Arbutus Tree. The European species, while quite different, is also called a Strawberry Tree. Because of the plentiful berries formed in the fall. While bright orange red, the Madrone tree berries are about the size of a small wild strawberry. The color stuck and Madrone or Arbutus Strawberry Tree it is. It grows from northern California north to southern British Columbia and is found mostly there on the BC Gulf Islands, ending at the Northern Gulf Islands. Found on Cortes Island, BC, they do diminish on the north part of the island and are rare north from there as you get into a much rainier climate. Madrone trees like sun, really like it! They will twist and turn to find it if a competing fir tree tries to outgrow it. I guess this feature of its incredible shapes is part of what makes it on the list of favorite trees! Not only is the twisting and bending a big part of its charm, but its bark gives the tree its amazing bite! 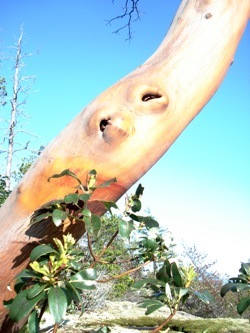 This Madrone tree is laughing hard! The bark sheds in the summer revealing a silky smooth glistening pale green yellow bark underneath. As the new bark ages during the year, it turns red and then dark red. By then it starts to peel in big shreds adding an amazing feature to the tree. Older trees do not peel all the way down to the ground. 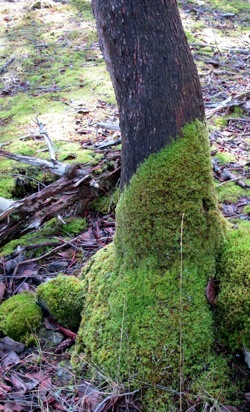 The bark stays but has a shredded look about it often with moss growing up a bit of the tree trunk for effect! You will also find it called Pacific Madrone or Pacific Madrona for the fact that it loves growing close to the ocean and we mean the Pacific Ocean in this case! All of these names refer to the same tree, Arbutus Menziesii. The latin word "arbutus" was used in early times around the Mediteranean. Archibald Menzies, a botanist who came to the Pacific Northwest with Captain George Vancouver in the late 1700s, named the tree. In fact, it is Canada's only native broadleaved evergreen tree. It looses its leaves only after new ones have grown in the summer so it is never naked of leaves. In the early spring it starts to grow blossom greens that turn into gorgeous white Arbutus flowers. They perfume the air with a heavenly scent much like a delicate lilac. By the fall, those blossoms have turned into abundant berries. I should say that this happens only on a "good" year because the amount of blossoms and hence berries depends on the previous summer's weather. If very hot and dry and drought conditions which sometimes happens, then the following spring will be an abundant year. The trees create the blossoms and its ensuing berries to ensure the survival of the species. Native Americans do eat those red Madrona berries but mostly use them for a cider. The berries make a gorgeous necklace if you gather them in the fall and pierce them with a needle holding a clear filament. They dry to a hard rock texture. With an Arbutus wood pendant, they would be stunning! 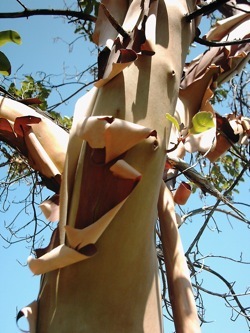 The Madrone tree is a Native American sacred tree. Thus the wood was never used for fire even though it burns long and hot. 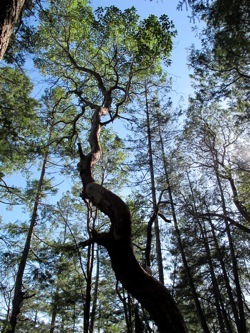 Sacred trees like the Arbutus tree hence make an incredible sacred pendant or sacred necklace. Later I will share with you more about its history and legend in how the Madrona became a sacred tree. It is a great story. Native peoples used the bark and leaves for colds. The bark was used for tanning or dyeing and small pieces of wood for tools. Curved limbs could be used for dwellings as their shapes could be ideal for entry ways and roofs. Today, you will find many custom home builders using branches for banisters and small pieces for drawers and cabinets. 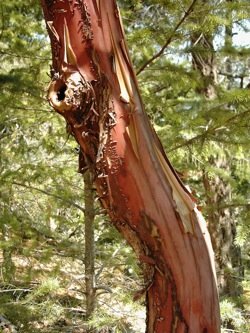 Amongst the trees of the Pacific Northwest, the Madrone Tree is often confused with the Manzanita Tree because of the similar coloring of the bark. It is a actually a shrub cousin of the Madrona and you will find more about Manzanita here on ArbutusArts.com. • Get a small seedling from a nursey and less than a foot in height is ideal. • Mark the compass directions north south on it so you can plant it in the same direction at home. • Plant it on well drained soil, south to southwest facing and free of lime on poor soil. It actually likes rock and will grab hold with its roots in time. • Make sure it gets lots of sun. A rocky bluff is ideal so the water easily drains away in the wet season. It likes it hot and dry in the summer. • Once it takes do not do anything to it...no extra water or soil additives otherwise you will make it susceptible to diseases. If this works you win the prize as a green thumb gardener! And you will have something wonderful to watch for the next several hundred years! ps. Keep the seedling protected from deer who love baby Arbutus trees and will eat the tender leaves. 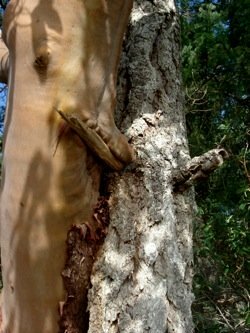 If a live Madrone tree falls down in a storm, the deer will strip it bare of its leaves in no time. If it has berries, they will be gone in a flash. They love arbutus tree berries as do many birds! And bees and butterflies love its blossoms. I have been able to entice a giant buck to eat them out of my hand because he could not reach high enough on the trees to get them. He watched me pick them. I left a trail of yummy berries (in his eyes!) to me with the last batch in my hand. That was quite a thrill looking into his huge brown eyes as he nibbled! I called him Bucky. You can read more about Bucky in my journal. A Madrona tree can grow to 100 feet in height and giants can be from 5-10 feet in diameter. But most will be much smaller as they often cling to the rock on cliffs and perches above the sea. If blown over in a storm, they will still grow as long as the roots are attached. It will grow new branches facing the sun. The shapes and contours are endless and a big part of what makes the Madrone Tree such a favorite tree for so many who discover its charms. ...if another tree, like a Douglas Fir, competes for sunlight and blocks it, the branch will die off. ...if a drought happens in the summer, the tree will sacrifice a branch for its moisture and allow the branch to die. ...or if a limb breaks off in a storm. ...then the live part of the branch retreats back to the main trunk or branch and leaves behind these knobs. Some have startling features! 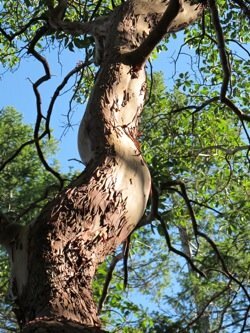 No wonder the Madrone Tree tops the list of favorite trees! For more on the Madrona Tree, please go to the page below on the Arbutus Tree. Remember it is the same thing, just a different name, but you will find more valuable insights there. 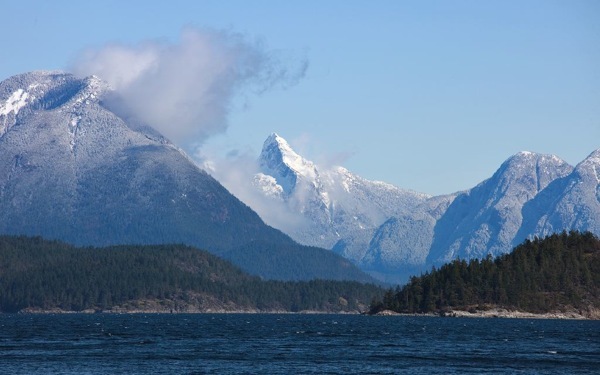 ... and here is another view of Mt Denman at the end of Desolation Sound, taken from Tiber Bay on Cortes Island, BC. 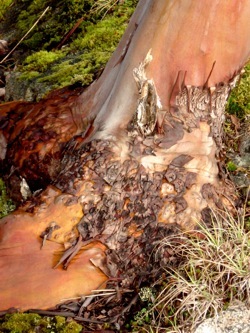 What's Your Favorite Picture or Story about a Madrone Tree? 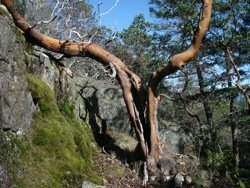 If you have been to the coast or live here, then perhaps you have a Madrone tree story or favorite picture to share. Whatever it is, please share it here! Can this hardwood be used for bird perches? Largest Madrone Tree In The World? Love it or Hate it- Arbutus Tree?